Join us online for the launch of our new web site on March 16th 1.30-2.30pm GMT. 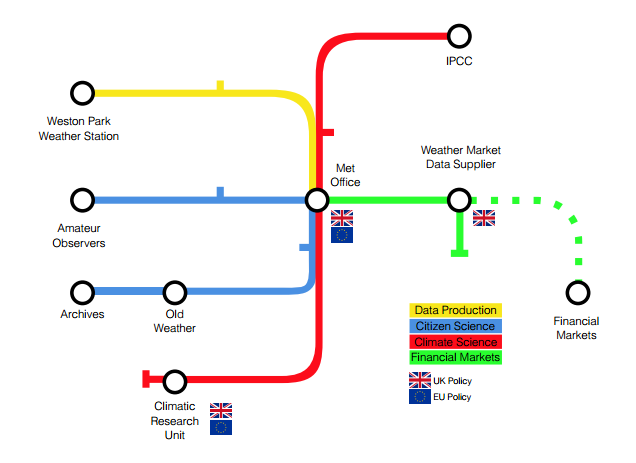 Follow data journeys through the weather and climate data infrastructure using our interactive web site map at lifeofdata.org.uk. On the day, go to the lifeofdata.org.uk website* and explore the cultural life of data as it flows through the UK’s weather and climate data infrastructure. Then contribute your thoughts to the live chat on Twitter (#lifeofdata) and by adding your voice to the unfolding discussion in the comments section of the website. *Note: our new web site will not be live until 16th March, and until that time, the URL points to our temporary blog. On the 16th March we are hosting an end-of-project event at the Information School in Sheffield. Participants include representatives from academic research, education, citizen science and more. The day starts with project talks from Jo Bates (project PI) and Paula Goodale (RA). Jo and Paula will present on some of the key findings from our analysis of the Secret Life of a Weather Datum data, and give insights into how the data was collected. In the citizen science session, research participant Joan Arthur will talk about her experience of volunteering on the Old Weather project, and Danny Antrobus of Better With Data will talk about the Air Quality+ project. During lunch, participants will have the opportunity to try their hand at building a simple Raspberry Pi weather station, based upon the SheffieldPiStation project, developed by our student Romilly Close. Full instructions and code are available online for anyone who wants to have a go in their own time. Components for building a Raspberry Pi weather station. At our web site launch, participants are invited to explore the site, contribute to the public conversation about the findings, and give us feedback for future development. The web site presents findings from the project in an interactive style, incorporating a novel map-based navigation. We welcome contributions to this session both live at the event and from people joining us online at lifeofdata.org.uk, from 1.30-2.30pm*. The impact workshop focuses on exploring ideas for developing the impact of the project outside of academia. Context from a research council perspective will be given by Prof. Andrew Prescott (Leadership Fellow for AHRC’s Digital Transformations theme), and we welcome ideas from practitioners and public perspectives. A panel discussion on the theme of ‘Data dissonance – hype, power and engagement in the data revolution’ will provide an opportunity to hear from contrasting points of view and to contribute to a lively discussion. Panel members are Prof. Andrew Prescott (Glasgow/AHRC), Danny Antrobus (Better with Data Society/Open Data Sheffield), Prof. Helen Kennedy (Sheffield), and will be chaired by Jo Bates (project PI, Sheffield). If you haven’t yet registered for the event, there are a still a few places left – sign up via our eventbrite page. We will also be live-tweeting throughout the day from @lifeofdata and #lifeofdata, so even if you can’t be in Sheffield, we hope you will join us, and join in the conversation. *Note: our new web site will not be live until 16th March, until that time, the URL points to our temporary blog. ‘The Secret Life of a Weather Datum’ is our new research project looking into the impact of socio-cultural values and practices on ‘big’ data sets as they are produced, transformed, and reused in a variety of contrasting contexts: government; climate science; financial markets; and, citizen science. Starting with a single temperature reading, we aim to ‘follow the datum’ on its journey through these different scenarios, with a view to developing a new approach to researching big data production and use that takes account of these wider influences. Work started in January 2014, and we are currently planning the data collection for our first two case studies focused on government data production and climate research. Over the coming months we aim to conduct interviews and observations in key organisations, and we’ll keep you posted as the work unfolds. Public engagement and impact is another important element of the project, so look out for our interactive web site in due course, which will allow you to follow the datum yourself, and to access a variety of publications and resources via open access and open data licences. More details are given in the Project Overview page and for latest news, please follow us on Twitter.